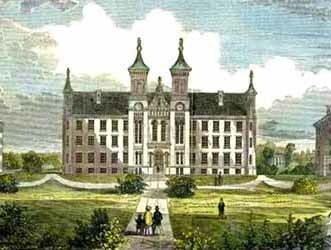 The Christian Church founded Antioch College in Yellow Springs, Ohio, in 1852. The college admitted its first students the following year. Antioch's first president was Horace Mann, a nationally known expert on education in the nineteenth century. Although the Christian Church was instrumental in the college's start, Antioch soon became known for providing a nonsectarian education. Although Antioch College was coeducational from the beginning, young women who attended the college in its early years were sometimes frustrated by the social restrictions that they faced. While male students were required to present speeches from memory before their classes, the women only had to read their papers. Professors assumed that women were not capable of memorizing their speeches. Student Olympia Brown, later the first ordained woman minister in the United States, challenged these expectations by presenting all of her papers from memory. Women also did not take physical education classes during the college's early years. Like many other colleges in Ohio during the antebellum period, Antioch students were usually abolitionists. Mann, also known for his anti-slavery beliefs, encouraged this sentiment at the college. Mann believed that the students should work hard to contribute to the moral fabric of society, once stating, "Be ashamed to die until you have won some victory for humanity." Antioch College has adopted this statement as its motto.